New web Sell screen FAQs – How can we help? You gave us feedback, and we listened. Why should I switch to the new Sell screen? How do I train my staff to use the new sell screen? How do I search for customers? How do I search for variants? How do I switch users? How do I close my register at the end of the day? How do I print my register closure? How do I view and print my sales totals for the day? How do I set up cash management? How do I set up cash rounding? How do I enable gift cards? How do I switch outlets or registers? What do I do if i've retrieved the wrong layby or on account sale? What happened to sales history and where do I find my open sales? How do I apply discounts to a single item? Where are the tabs for Quick Keys? Can I add a variant as a Quick Key? How do I choose whether a Quick Key folder opens or closes until the end of the a sale? Why can I no longer select On Account or Loyalty as a payment option for a return or negative sale? If I use Choicepay, will it still be compatible with the new Register Sell Screen? If I use Smartpay for web, will it still be compatible with the new Register Sell Screen? Important: This is an update to our web based sell screen on Mac and PC. For more information on our dedicated iPad app, click here. We’ve improved the design and performance of our Sell screen, plus added tonnes of great new features to help you run a better business. The switch to our new sell screen is easy & free. The update will be applied across all of your registers and outlets and your products, and Quick Keys will be ready and waiting for you. A New Design - Search for customers and products all in one place, or jump to Products, Settings or Ecommerce in a jiffy. All on a design optimised to fit your screen. Training Mode - Let your staff get familiar with Vend without affecting your sales information. You can go back to training mode anytime you want. Learn more about Training Mode here. Store Credits - Keep your customers coming back for more by issuing store credits instead of cash refunds. Learn more about Store Credit here. Cash Management - Reduce errors, theft and discrepancies by recording all changes from cash float to register closures. Learn more about Cash Management here. Cash Rounding - Round your cash payments without workarounds or tedious reconciliations. Only available in the new Sell screen. Learn more about Cash Rounding here. Gift Cards (only available on certain plans) - Bring in new customers and increase revenue with flexible and brandable gift cards in your store. Learn more about Gift Cards here. Where is this new sell screen available? 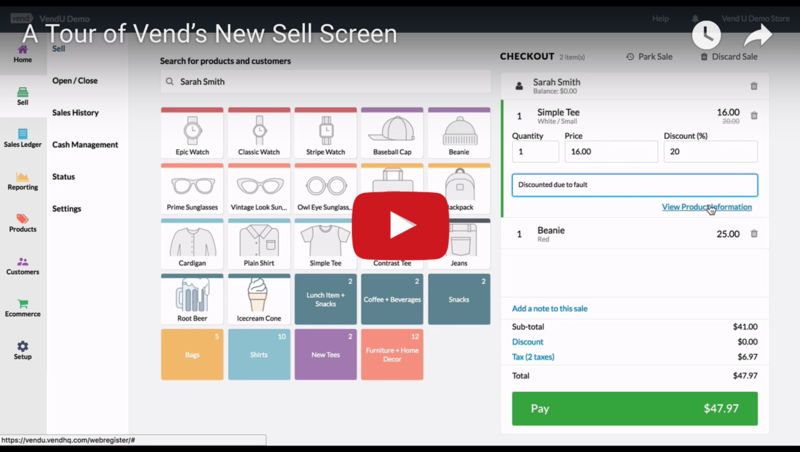 The new sell screen is available for all Vend customers using Vend on web-based devices such as a Mac or PC. For more information on how to get started with our dedicated iPad app, click here. The easiest way to get your staff up and running with the new Vend sell screen is to enable training mode. To enable training mode, head to Sell -> Settings in the sidebar and select Enable Training Mode. Once training mode is active a blue bar will appear at the top of the screen and a tutorial will take your staff through the ins and outs of the selling process on the new sell screen. For more information on Training Mode, click here. Note: No information is synced or saved when in training mode. So long as the blue bar is along the top of the screen you can continue to make dummy sales without it affecting your records. If you need to make a proper sale, make sure to turn Training Mode off beforehand. To search for a customer, navigate to the right-hand search box, type the customer's name, phone number, email, company or customer code. To search for a variant you can either search for the variant by name, handle or SKU. Alternatively you can search for the primary product (e.g. T-Shirt) and then, when you select this product, you will be prompted to choose the available variants (e.g. colour -red, size - large). If you would like to switch users on the sell screen, navigate to the top right of the screen and click the username. Once here, click the Switch User button. You will be taken to a screen where you can choose which user you'd like to switch to. If you have a high number of users, a user search bar and filter will appear to help you navigate to the correct user faster. Note: If the user was not already signed in you may have to enter the user's password. 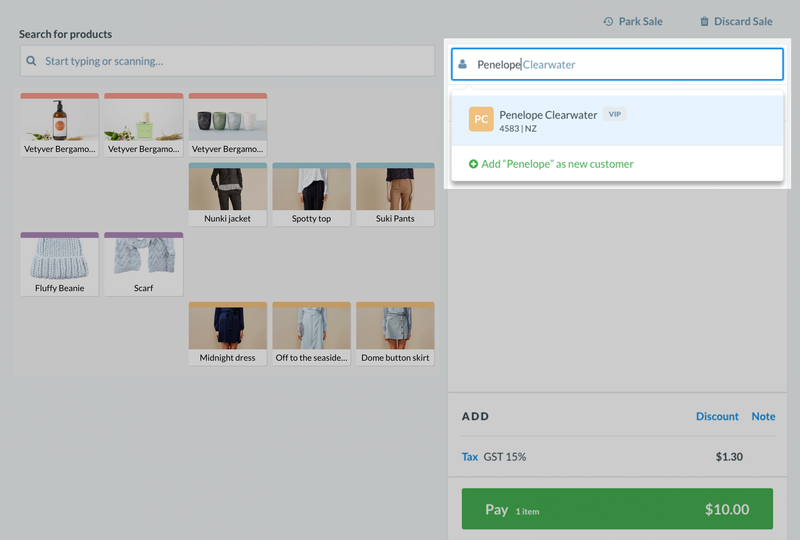 If you would like Vend to automatically prompt you to switch users after you process a sale, check out this article here. To close your register, select Open / Close from your side menu. You’ll see the new register closure screen where you can enter the counted totals for each payment type and compare it to the expected totals. Once you have filled in the necessary fields, just click on the button that says, Close Register. The expected values should match your counted values, but if they don’t, the difference will automatically be calculated for you to help you find the discrepancies. 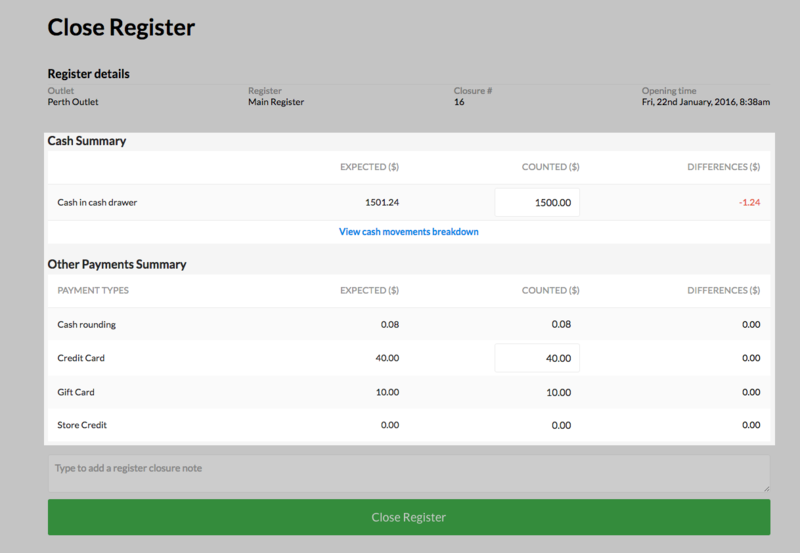 The option to print your register closure will now appear after you select Close Register on the register closure page. This ensures that the summary report contains the most accurate information and reduces any chance of fraud. You can also view your sales totals for the day after closing your register. To do this, scroll to the bottom of the register closure page. Once here, you can view a breakdown of the payments and sales totals for this register closure as well as any cash movements (if you have cash management enabled). You can also print this screen by clicking CTRL - P on a Windows computer or Command - P on a Mac. Important: If you integrate with Xero and are looking to set up cash management, you must follow the steps at this link here. If you do not map the correct account codes in the Vend - Xero mappings page, cash movements will not flow through to Xero. To set up cash management, you will need to navigate to Setup -> Outlets & Registers and enable Cash Management on a per-register basis. For a step by step guide on how to set up cash management, click this link. 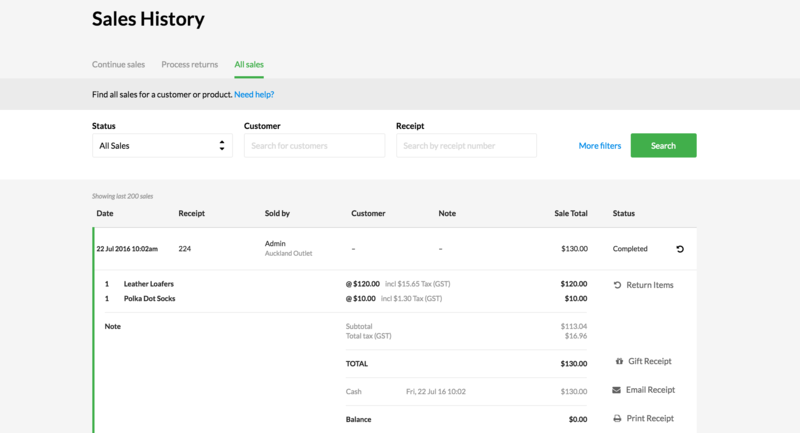 Important: If you are setting up cash rounding, and also integrate with Xero, you must map the correct Xero expense account to cash rounding expense in the Vend - Xero mappings page. For more information on how to do this, click here. To set up cash rounding, navigate to Setup -> Payment Types and find your cash payment type. To activate cash rounding, you will need to edit this cash payment type. To do this, click the 'pen' icon next the payment type and specify the "round to" amount and the "rounding rule". For a step by step guide on how to setup cash rounding, click this link. 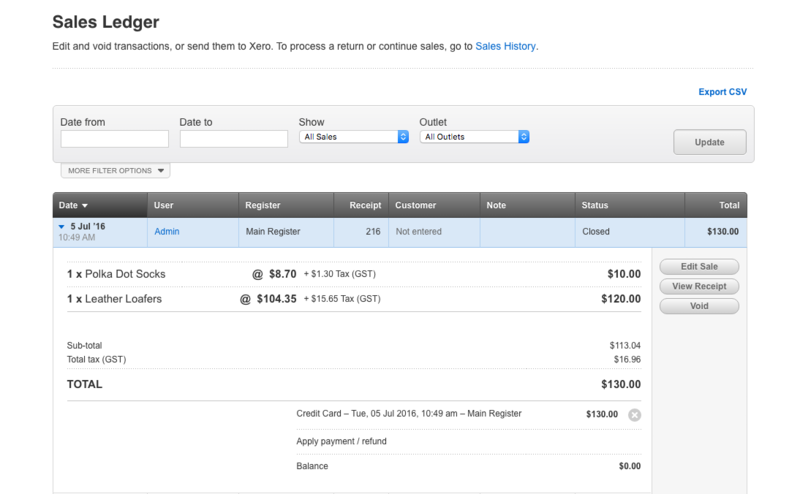 Important: If you integrate with Xero, you must map the correct account code to your gift card payment type and your account for liabilities in the Vend - Xero mappings page. To learn how to do this, click here. Certain pricing plans give you access to Vend's gift card feature. You can enable gift cards by heading to Setup -> Gift Cards and clicking the switch next to Enable Gift Cards so that it displays a green tick. For information on how to setup these gift cards and what to do if you integrate with Xero, click this link. 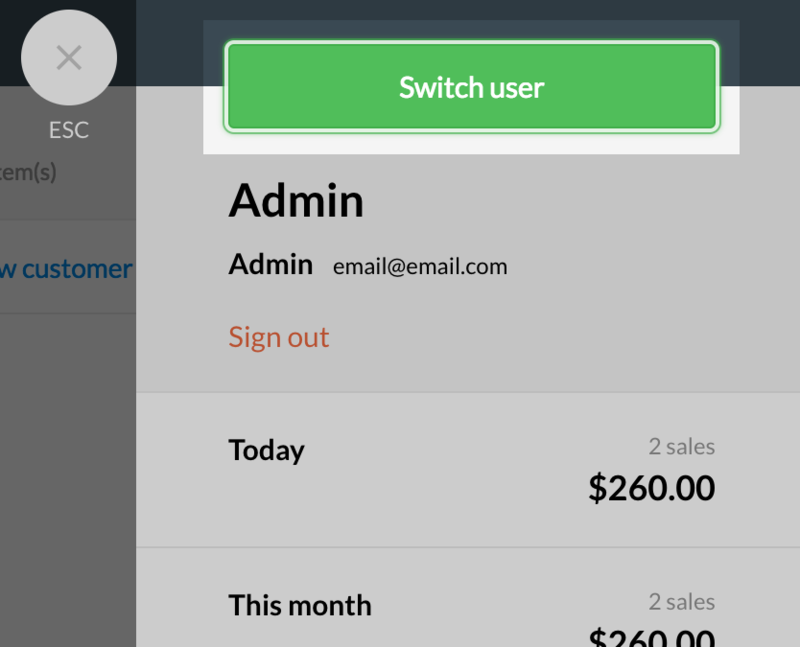 To switch to a different register on the Vend sell screen, click on the register/outlet name in the top left of the sell screen and click Switch Register. For more information on switching outlets or registers, check out this link. Once you have retrieved an existing Layby or On Account sale, you will not be able to void the sale or remove any of the products invovled. You can, however, clear this layby or on account sale from the sell screen if you retrieved it by accident. To do this, click on the "Balance" or "Pay" button and then select either Layby or On Account from the payment screen (make sure you don't pick On Account for a layby sale or Layby for On Account sale). Once this is done the Layby or On Account will be placed back onto it's original record. 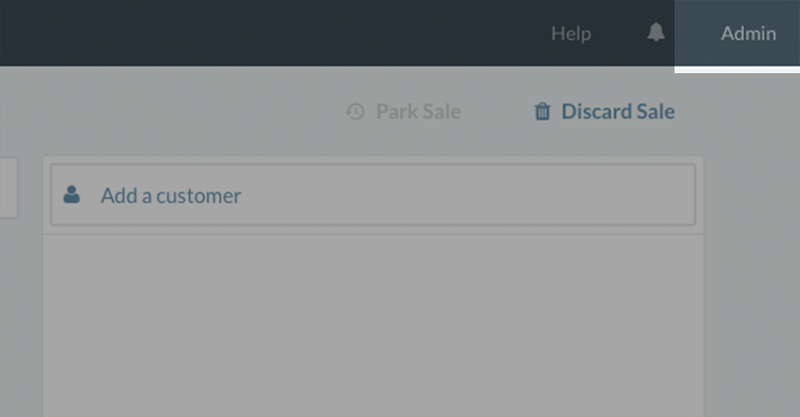 Within the Sales History there are three top tabs; ‘Continue sales’, ‘Process Returns’ and ‘All sales’. ‘Continue sales’ contains a filtered list of your parked, layby and on account sales. The Process returns tab contains all sales that have been completed and are valid to return. In the ‘All sales’ tab you will see an unfiltered view of all open and completed sales. Discounts can be applied to an entire sale or individual line items. 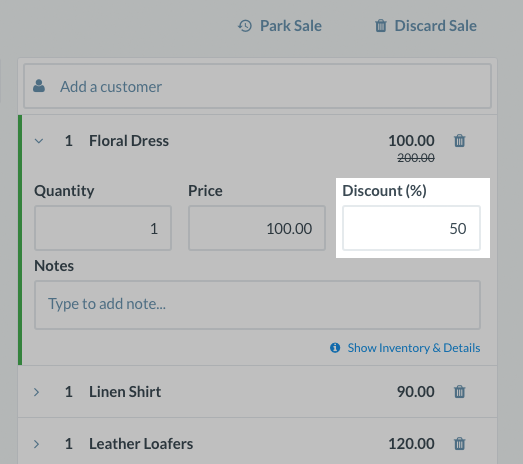 To discount a single line item, click on the item once you’ve added it to your sale and you’ll see an expanded view. In the expanded view, you can adjust the quantity, price, or discount amount for that item. If you previously had multiple tabs for your Quick Keys, they have been converted into folders. When you select a folder, you will see all the Quick Keys that were once under a tab. Unlike tabs, these folders do not have any restrict you to a limited amount of quick keys. Yes, you can! To add an indvidual variant as a single quick key all you need to do is edit your quick key template under Sell -> Settings and add the variant product using the search box. When adding a new quick keys layout or editing an existing one, tick or untick the box beneath "Quick Key Behaviour" to choose whether a quick key folder remains open until the end of the sale. For more information on setting up quick keys, click here. We have added store credit as a new feature! Store credit will allow you to offer store credit rather than a cash refund and keep your customers coming back. Customers with store credit can redeem their balance any time they are in your store, and you will no longer have to use workarounds or do messy reconciliations. Learn more about store credit here. 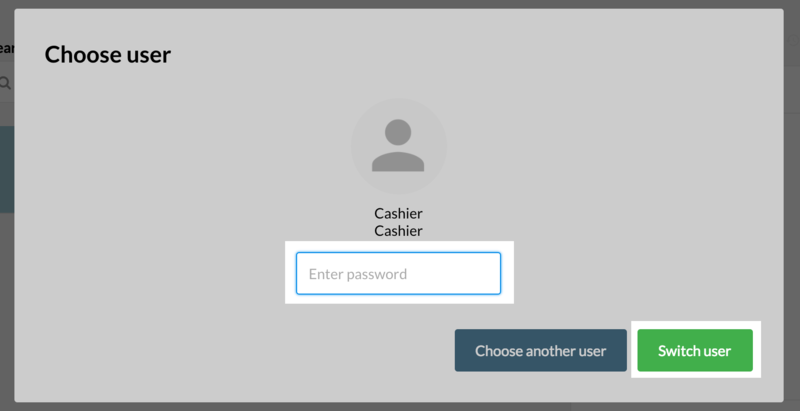 To continue using Smartpay with the new Register sell screen on PC, you will need to upgrade to a version of Smartpay that is newer than February 2015. If you don't know what version of Smartpay you are using, get in touch with Smartpay and they will help get everything updated for you. Alternatively, you can check and update this yourself. To do this, go into the 'Programs' folder on your PC and see when the Smartpay software was installed. Do not check via the version number as it will only have the first 3 digits. If it was installed before March 2015 then your version is outdated and will need to be updated. To do this, install the newer version from this link. Important: Before installing this new version you must uninstall the old version first.